A plane crashed and erupted in fire on a busy California highway - the 101 Freeway - on Tuesday, bringing traffic to a halt. 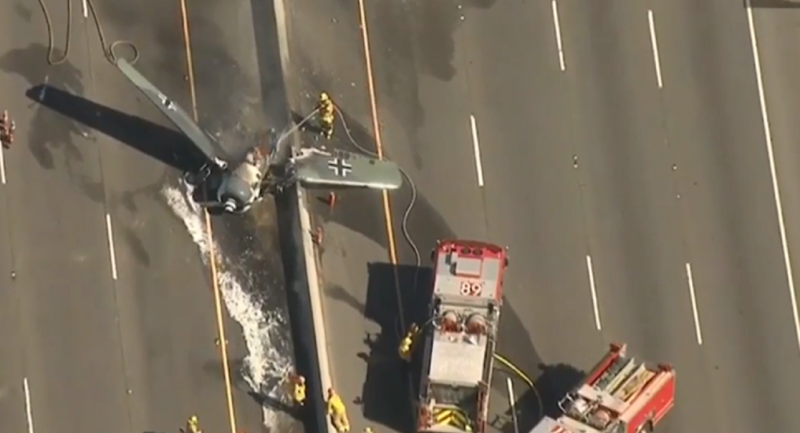 The pilot of the aircraft was uninjured as he was pulled from the plane before flames consumed it, according to the Los Angeles County Fire Department. An aerial video posted to Twitter shows the plane — much of it missing — engulfed in flames, one wing hanging over the highway divider. No vehicles were affected by the crash. The plane is reportedly a North American AT-6, which are often used in air shows. This one was painted to resemble old German planes and belonged to the Condor Squadron, a group that performs in airshows, memorial services, and other events, according to Condor Squadron president Chris Rushing.